Chuck & Bung Sweet & Sour…. Yum!! Use the Measure All Cup to measure the ketchup and the vinegar, tip into Classic Batter Bowl. Add the dark brown sugar, using the Adjustable Measuring Spoons. Use Forged Cutlery Utility Knife to chop the chicken and add to the mix. 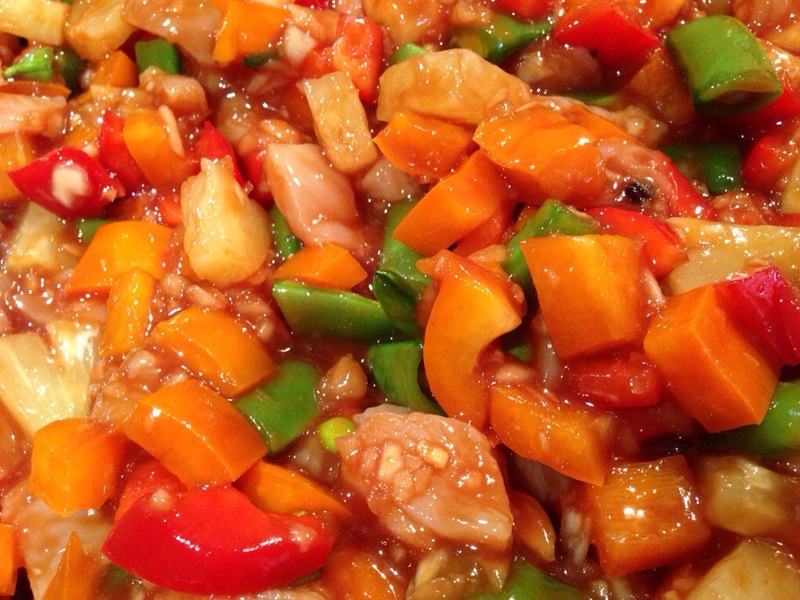 Throw in any chopped veg as desired! Mix well with Small Mix ‘N Scraper. Chuck everything into the Rectangular Baker and bung in the oven at 180 for about 35-40 minutes. 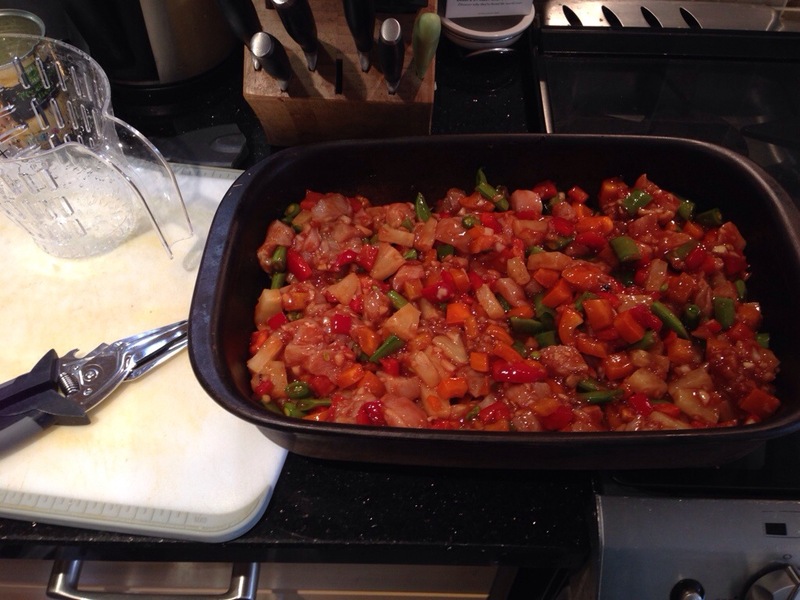 Sweet & Sour Ready for the oven. This is a brand new recipe to me but, apparently, a bit of a classic to The Pampered Chef. I have never made, nor eaten, a jalousie before – however I am completely won over! I had been asked to do something different for a show and also a vegetarian recipe. This was recommended to me and turned out to be an absolute winner. It is so easy, and yet looks really great, and tastes fabulous. Sadly, I forgot (again!) to take a photo this time. So I shall just have to make another one! I think I might make it for a light lunch with friends, or when I am next asked to make something for a bring and share party, or just when I have some spare puff pastry that happens to make its way into my shopping trolley!! Preheat oven to 200°C/fan 180°C/Gas 6. Allow pastry to stand at room temperature 15-20 minutes. Meanwhile, snip sun-dried tomatoes into small pieces using Professional Shears. Press garlic with Garlic Press. Combine sun-dried tomatoes and pesto sauce in Classic Batter Bowl; mix well using Master Scraper. Set aside. Lightly dust Rectangle Stone with a little flour. Place one sheet of pastry on stone. Using Baker’s Roller®, roll pastry to form a 28 x 33 cm rectangle. Spread pesto mixture evenly over pastry using Small Spreader, leaving a 2.5 cm border around edge. Carefully slice each log of goat’s cheese using Utility Knife. Arrange goat’s cheese slices over pesto mixture in single layer. Brush edges of pastry sheet with water using Chef’s Silicone Basting Brush; set aside. Roll second sheet of pastry on lightly floured, flat surface of Large Grooved Cutting Board (to rectangle of same size). Fold pastry rectangle in half lengthways. On folded-length, cut about 11 cm length strips, about 2.5 cm apart (do not cut through ends). Gently open pastry sheet and place over filling; press pastry edges together to seal. Using Crinkle Cutter, trim edges of puff pastry; discard trimmings. Flute pastry edges, if desired. Beat egg in Small Bamboo Fibre Bowl with Stainless Mini Whisk; brush over surface of pastry. Sprinkle sesame seeds evenly over top, if desired. Bake 25-30 minutes or until deep golden brown. Remove to Stackable Cooling Rack; cool slightly. Sprinkle with shredded basil leaves, if desired. Cut into squares using Pizza Cutter; serve warm using Mini-Serving Spatula. 1) Chop onion and red pepper (and chilli if desired) using Food Chopper or Manual Food Processor add to Deep Covered Baker / Rectangular Baker. 6) All ingredients are now in Deep Covered Baker / Rectangular baker (if using a smaller baker just reduce ingredients slightly), stir. Hotpot after half was served! Here in the UK, The Pampered Chef are just about to launch a brand new type of Stoneware. It claims to cook just as fabulously as normal Stoneware but it is able to cook on a hob, on a BBQ, under the grill and be washed up in the dishwasher! Obviously, I needed to check these claims out and decided the best way was to try one of the recipes that comes with the “Dutch Oven Rockcrok”. As I had to feed at least 8 people I decided to start with this recipe. 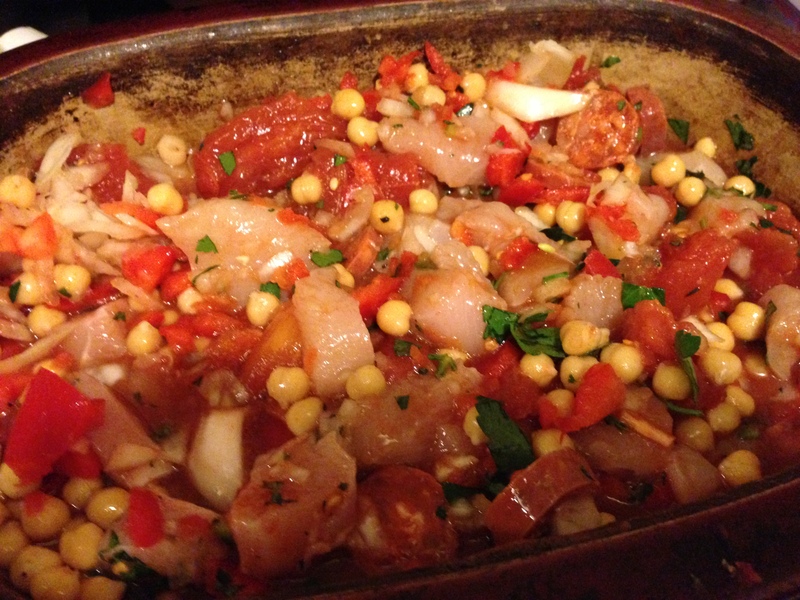 This recipe is brilliant because it is quite simple, with a bit of pre-prep on the hob and then left to slowly cook in the oven until the pork melts and the sauce is absolutely gorgeous. Everyone in the family LOVED this. Suffice to say, I shall be making it again. And the RockCrok??? So far, so absolutely amazing! Plus putting it in the dishwasher afterwards was very pleasing! Preheat oven to 170C/ fan150C/ Gas 3. Heat 1 tbps of oil in RockCrok Dutch Oven over medium heat for 3-5 mins or until hot. Add onion, carrots, celery and garlic. Cook for 2-3 mins or until tender, stirring occasionally. Remove vegetables to a plate; set aside. Add 1 tbsp of remaining oil to Dutch Oven. Add one quarter of the pork, cook uncovered, 3-4 minutes or until lightly sealed, stirring occasionally. Remove to a large dish. Repeat sealing of remaining pork, in 3 batches, adding 1 tsp of oil for each batch. Set pork aside. Add remaining oil to Dutch Oven, cook bacon, uncovered, 2-3 mins until lightly browned, stirring occasionally. 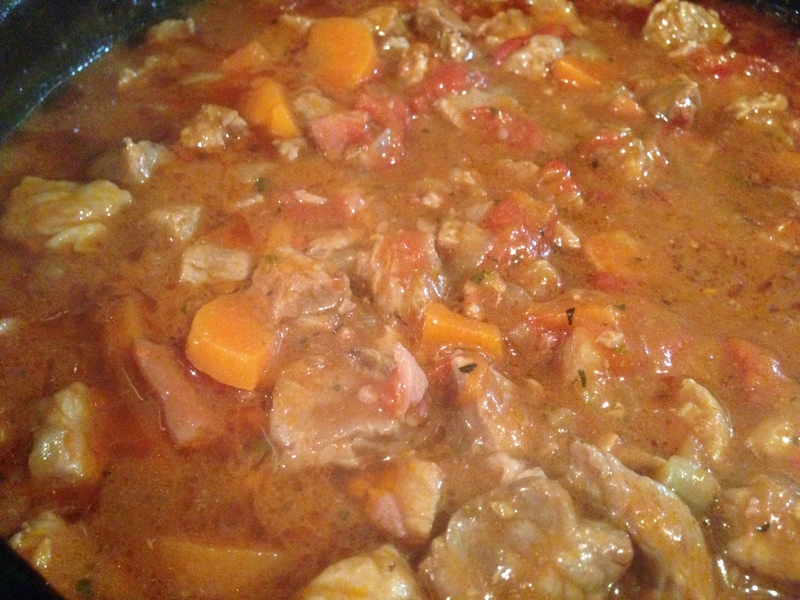 Return pork to Dutch Oven, stir in flour, mix well. Cook 1-2 mins or until lightly browned, stirring continuously. Stir in veg, wine, dried herbs and tomatoes. Chop tomatoes using Mix ‘N Chop. Increase heat to med-high; bring to the boil, stirring continuously. Cover; transfer to oven, bake 1.5-2hrs or until pork is tender. Remove from oven. Garnish with chopped parsley if desired. Serve with cooked pasta (I went for tagliatelle). Nutrients per serving: Energy 1333kj. 319 kcal; Protein 36.3g; Carbohydrate 10.1g; Sugars 5.4g; Fat 13.1g; Saturated Fat 3.6g; Fibre 1.8g; Salt 1g. This is an amazing revelation. There is another chorizo risotto recipe on here which can be made in the microwave. Last night, for the first time, I tried it at a Pampered Chef show in the oven. No stirring, no faffing, just Chuck in the ingredients and Bung in the oven! It worked perfectly and was absolutely delicious. So here it is just for you! Finely chop onion using Food Chopper. Dice sun-dried tomatoes on Cutting Board using Utility Knife. 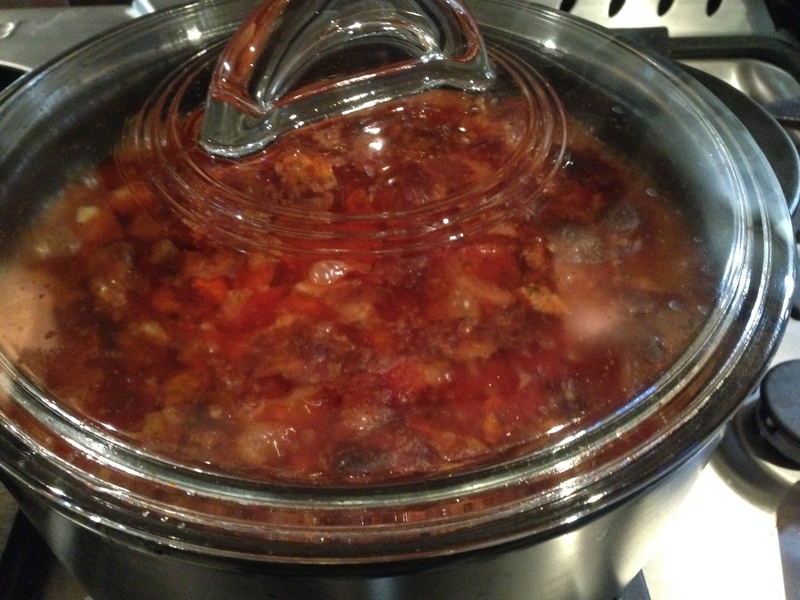 Place onion, rice, olive oil, chorizo, stock, sun-dried tomatoes and garlic pressed using Garlic Press in Deep Covered Baker; mix well using Small Mix ‘N Scraper®. Put in oven at 200C with the lid on. Meanwhile, finely grate cheese using Microplane® Adjustable Fine Grater and chop parsley using Professional Shears and a Prep Bowl. Remove baker from oven; add grated cheese and parsley and mix well. Cover with lid; let stand 5 minutes or until cheese has melted and risotto has a creamy texture. Diced Spanish chorizo sausage can usually be found in the fresh cooked meat section of supermarkets. Alternatively buy a whole chorizo sausage, remove any skin and dice the sausage before adding to the risotto. Substitute the hot chicken stock with hot vegetable stock, if desired. 8th April 2014: Update…. I have recently been making this Chorizo in my Rectangular Baker (i.e. no lid) and just cooking it for approx 30-35 minutes until it is done. Just Chuck (it in the Stoneware) and Bung (it in the oven)!!! © 2014 The Pampered Chef used under license. 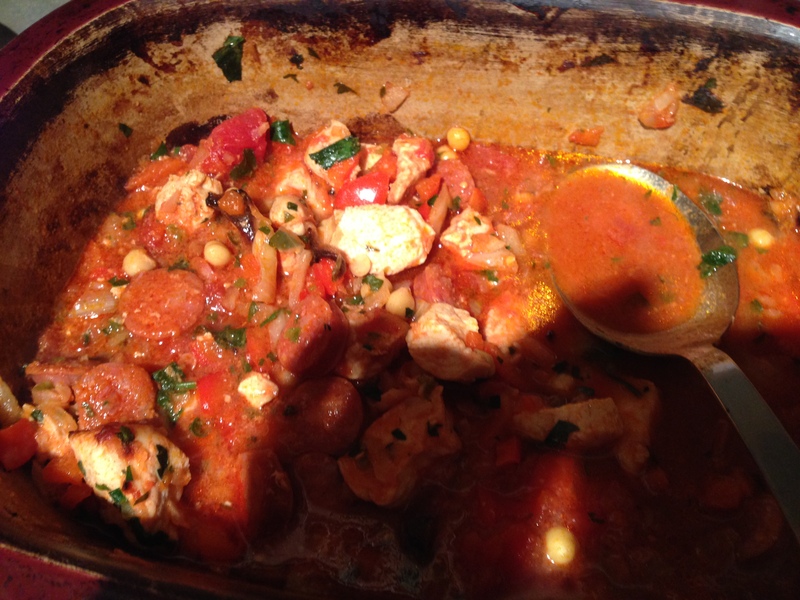 This is a store cupboard recipe I have adapted from the Sainsbury’s magazine. It is exactly what is says in the title, easy and also really tasty. Boil the eggs for 6-7 minutes. Drain, run under cold water, until cooled. Peel, halve and set aside. Heat the oil in 24cm Executive Saute Pan. Add the chopped onion and fry for 15 mins, or until it has softened. Add the garlic, mustard seeds and curry paste. Stir fry for 2 minutes, then add the coconut milk and tomatoes. Bring to the boil, reduce the heat to medium, cover and cook for 5 minutes. Add the eggs and heat through for 1-2 minutes. Season and remove from the heat. Sprinkle with chopped coriander and serve with Basmati Rice and naan bread.